Normally I get my new recipes from blogs, or possibly Ina Garten. Now and again, Cooks Illustrated / America's Test Kitchen. I'm a fan of the Barefoot Contessa, as her dishes are doable. And for a a guy like me, I need them to be somewhat successful - even if I tweak them for my needs. Normally, I would say I seek out recipes with ingredients I'm fairly comfortable with (using and eating) and rarely go by images. So it surprised me that I went for something I saw in the New York Times Magazine site. I didn't recognize the chef's name - should I have? - so it seems unimportant for me to bring it up here. I mean, then I'd have to Goooogle it, and hyperlink it.....blah blah blah. It seems like work. 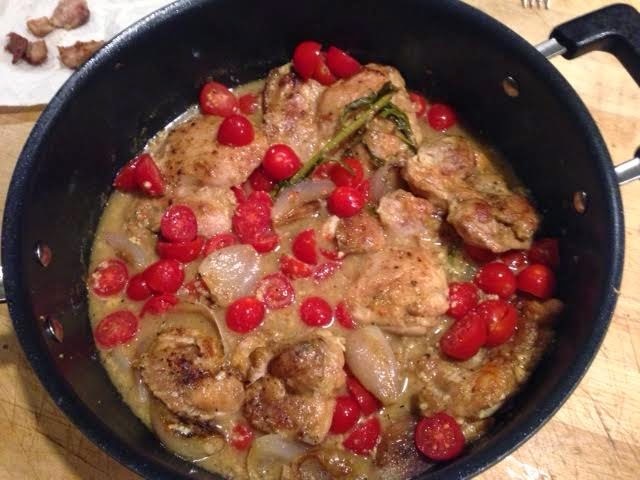 Anyhoo...I was drawn in by the picture of the dish: Chicken with Shallots. I like chicken. I like shallots. I also like the rest of the ingredients. All of them seem fairly standard. 2 cups cherry tomatoes, cut in half. 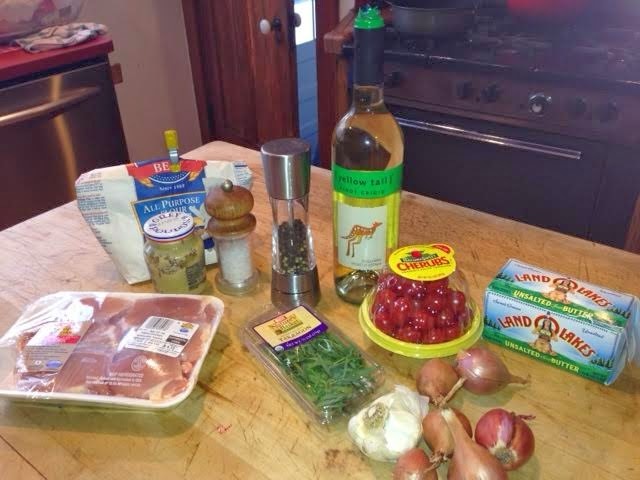 I rarely cook with tarragon (which besides the chicken, was the only ingredient I had to go buy) or wine. I drink wine, but I don't normally cook with it. I don't know why. But what the hell. And it seemed like a lot of shallots, but again - WTH. I made a few changes, but very few. The package of chicken thighs came in six. I wasn't buying 12, so I just made do. And I was too lazy to try to convert the rest of the recipe for a 25% reduction in protein. It takes longer to prepare this dish than I normally take (about 90 minutes in all), but it was well worth it. I did not take pics for each step. 1. Rinse chicken thighs in water, and pat them very dry with paper towels. Sprinkle over them the flour, salt and pepper. 2. Melt the butter in a large, heavy-bottomed pot or skillet set over medium-high heat. 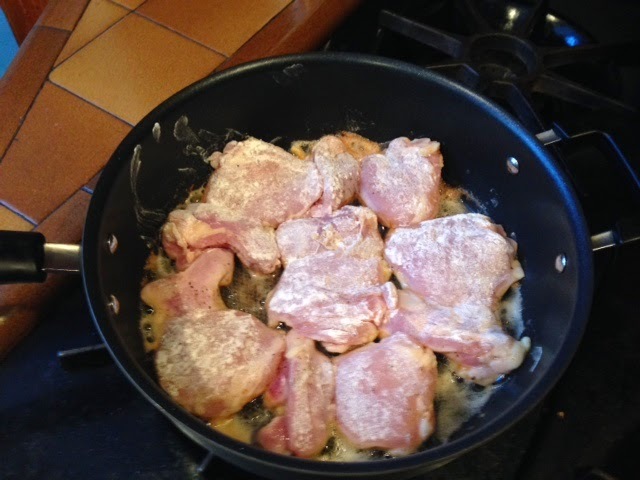 When the butter foams, cook the chicken, in batches if necessary, until well browned and crisp on all sides. Set aside. 3. Add the whole shallots to the pot and sauté them in the butter and chicken fat until they begin to soften and caramelize, approximately 10 to 12 minutes. 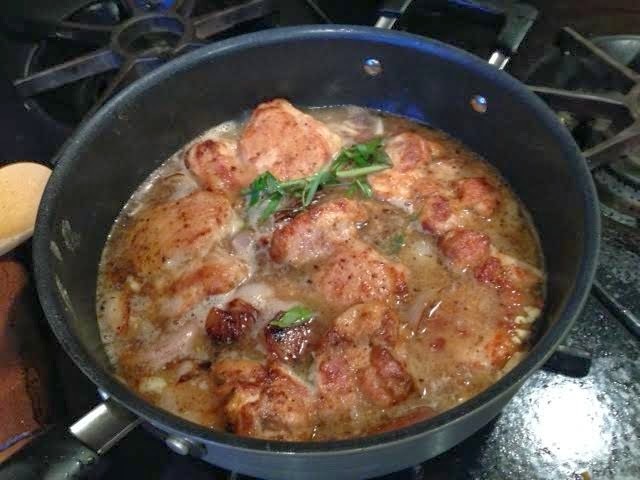 Add the wine to deglaze the pot, stir with a large spoon, then add the mustard and tarragon, then the chicken thighs. Cover the pot, turn the heat to low and simmer for 30 minutes. 4. Remove the lid, and allow the sauce to reduce and thicken, 15 to 20 minutes. 5. Add the cherry tomatoes to the pot, stir lightly to combine and serve immediately. The article said this serves 4 to 6. That would be with the eight thighs. Maybe the ones I bought were not huge, because those six might have served 3. Both 710 and I had two thighs each, and I could have probably eaten a third. Adding the cherry tomatoes after the fact, off the heat, was perfect. I'm not a fan of cooked tomatoes like that, so just stirring them in heats them without (over)cooking them. They don't get so mushy, as cooked tomatoes do. All I can say on the flavours is: wow. The dish smelled like mustard, but didn't taste like it. The mix of wine (2 cups seems like a lot, but hey! ), mustard, shallots and tarragon were perfect. And OMG, the shallots were great. They were sweet and absorbed the sauce and I was (almost) happy just to eat those. You needed no knife for the chicken. Now, the recipe didn't state whether the thighs should be boned or not. I got boneless, skinless, so cutting it with your fork was easy. The total 45 minute simmer time in the sauce really helped make it tender. Not only would I do this again for us in a heartbeat (it's a love beat! ), it's a great dish for guests. Fancy enough, but not too fancy. Naturally, I killed of the rest of the bottle of wine that didn't go into the dish. and how thoughtful of you to save some chicken for petey! Was it Mark Bittman? This sounds too fussy for him but he is amazing. One of my faves. I saw this on Sunday as well (yes, Mark Bittman) and am looking forward to trying it out. Unfortunately, my partner is a breast man so may have to put in a couple for him. Hmm...your blog...has it no search function?